In this blog, Glyn Everett presents and reflects on the ethics of care shown by some local users and residents towards blue-green spaces (primarily designed to manage flood risk), and how this can help increase a variety of multiple benefits. I have been spending time with interested groups around two of our (Urban Flood Resilience research project) study sites in Bristol. These are open green spaces, with retention ponds, designed to reduce the risk of flooding elsewhere. As such, they do not affect flood risk in their local vicinity and awareness of purpose and functions is, rightly or wrongly, very low. Chatting with local people, I have regularly encountered incredulity or disbelief when I have suggested that the areas were designed to reduce flood risk in other parts of the city. Why should anyone believe me? There is no clear evidential link, simply open green and blue spaces – for aesthetics and leisure, they might very reasonably presume. Unfortunately, it might also help explain why some treat these spaces with so little regard. It is not that they are badly treated, for the most part, but rather that the hard paths through them are used merely as convenient routes of transit, rather than the areas being more appreciated and valued. To this end, fewer people might ‘care’ for them, leaving them open to potential mistreatment and lesser ‘multiple benefits’. It therefore feels very positive when we see groups of residents and users who begin to take some ‘ownership’ (formal or informal) of these spaces, either to reshape them slightly to offer improved amenity, or simply contributing to the upkeep. Site 1 is a green space next to a modern housing development built with a concern for sustainability. A Residents Group convenes monthly to discuss issues arising, and during my time interacting with them, members have created an Environment Group to think about treatment of the land immediately surrounding the green space that is under their control. They have since spent some weekends clearing and tidying a nearby swale and planting wildflowers in a meadow. Some wildflowers had been planted by the developer, but these had been lost due to the voraciousness of neighbouring grasses. On one day I was with them, they spent as long digging spaces to plant Yellow Rattleweed as they did wildflower plugs. The Rattleweed should then parasitise the grasses and hold them in check, to allow the wildflowers to establish and thrive. In another nearby area sits a retention pond that has been overtaken by a type of Bulrush, installed by the developer. Being so voracious, it has taken over most of the pond; irrespective of how this may or may not affect the pond’s retention capacity, the Bulrush is a problem for the tadpoles, frogs and other flora and fauna. Biodiversity and amenity are impacted – the pond simply doesn’t look half as attractive. A few lay attempts have been made over the years at clearing the Bulrush, but because these have not cleared down to the roots, it has come back the next year. The group are now seriously considering hiring professional contractors to do an intensive clearance – although given that the funding has not yet been secured and the frogs will soon return to spawn, they may sadly have to wait another year before they can take action. 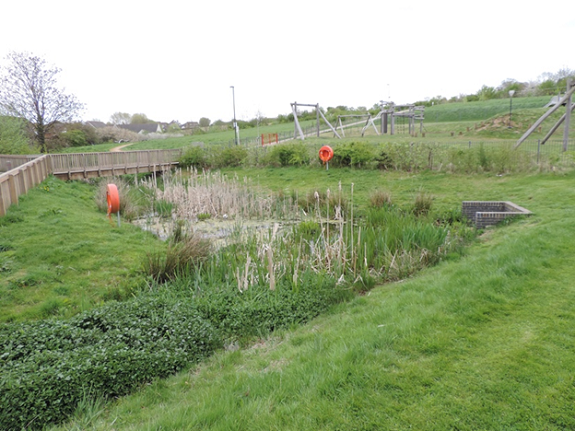 Site 2 is a large community park with several retention ponds that are tended and maintained by the Local Authority (LA). Two Friends groups also operate within the area. The first, a more environmentally-oriented group, conduct weekly litter-sweeps and have begun planting a small community orchard. The second operates within a small space to the side of the park that had previously been overgrown and had become a gathering-space for antisocial behaviour (drinking, littering and drug-use). The first group was brought together in reaction to the LA’s decision to do some quite large-scale clearing and desilting of the ponds; their functionality was being affected by the silt and plant-growth. The group were unaware of the ponds’ flood risk management function and were disturbed by what they saw as the wilful destruction of wildlife habitats. As a result, the group came into being, entered into some productive conversations with the LA and has become a valued LA ally in conducting low-level lay maintenance as well as clearing and planting the orchard. The second group are more spiritually-oriented; after some conversations with the LA, they took control of the neglected area. 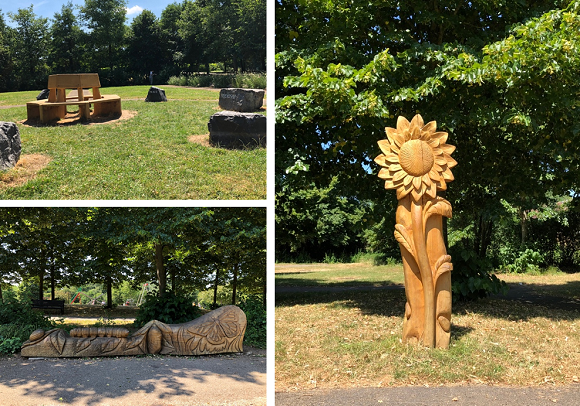 Following fundraising efforts and a lot of voluntary work, they have transformed it into a relaxing green-space, with seating and sculptures, hugely improving the amenity offer. None of these three groups had any awareness about the spaces’ flood-risk functions before meeting me, and with a couple it took some convincing before they believed such. However, all are actively interested in a number of the further multiple benefits that we argue blue-green infrastructure should provide: the aesthetics of the spaces, habitats for improved biodiversity, offering educational opportunities as well as some local food-cultivation and gathering. Whilst I began my work with them somewhat concerned about their lack of understanding of flood function, I have since become much more relaxed; so long as their interventions have no negative impacts, they can simply improve the overall offer of multiple benefits. If only more groups could gather to offer similar ethics of care around sustainable drainage systems around the country, ecosystem services assessments would be shifted more strongly toward the benefit over the cost end of the spectrum, and their ‘sustainability’ might be much more assured! Read more about Glyn Everett’s research on the Urban Flood Resilience Research Project (WP4). If you enjoyed Glyn’s blog see our earlier blog on how low-cost small-scale blue-green interventions and community led projects may enhance urban flood resilience.